There were 57 pupils in the FS cohort. There were 60 pupils in the Y1 cohort. There were 60 pupils in the Y2 cohort. There were 61 pupils in the Y6 cohort. In 2017 our results rose compared with 2016 and outcomes for children at Bridgetown remain well above national figures in most areas. 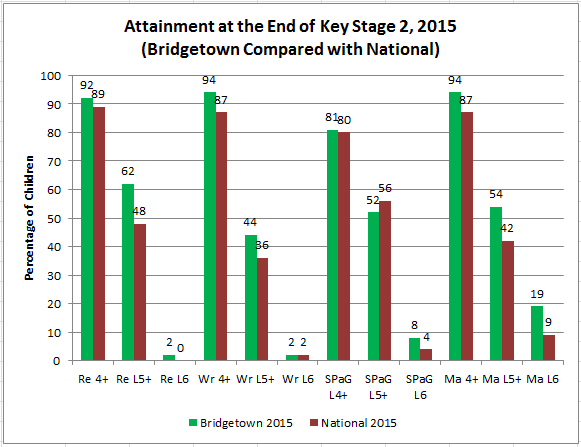 We are proud of the academic outcomes our children achieve at Bridgetown. In 2016 outcomes for children at Bridgetown were again above those for children nationally. 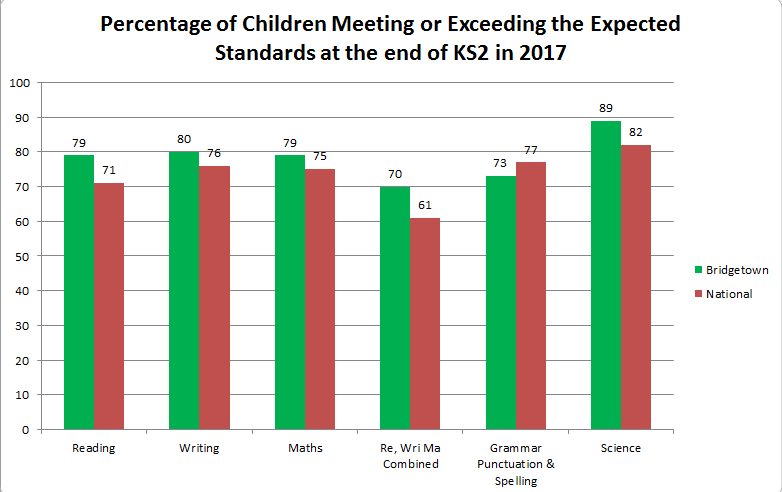 National: The red bar (to the left of each group of three) bar shows the percentage of children achieving the expected standard nationally. 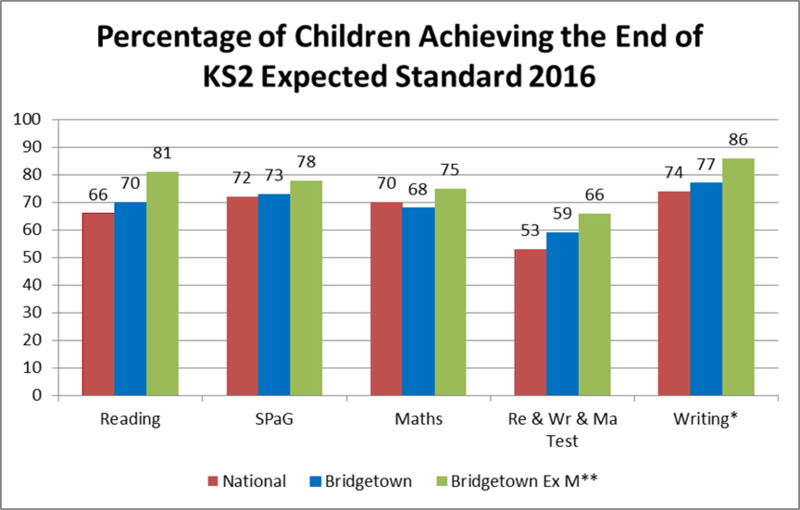 Bridgetown: The blue bar (in the middle of each group of three) shows the percentage of children at Bridgetown achieving the expected standard, including those who joined the school towards the end of Key Stage 2 (in Year 5 or Year 6). 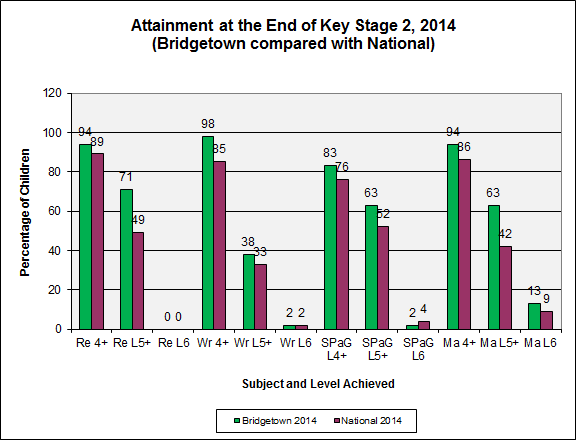 Bridgetown Ex M **: The green bar (to the right of each group of three) shows the percentage of children achieving the expected standard at Bridgetown excluding the mobile pupils who joined the school in Year 5 or Year 6. 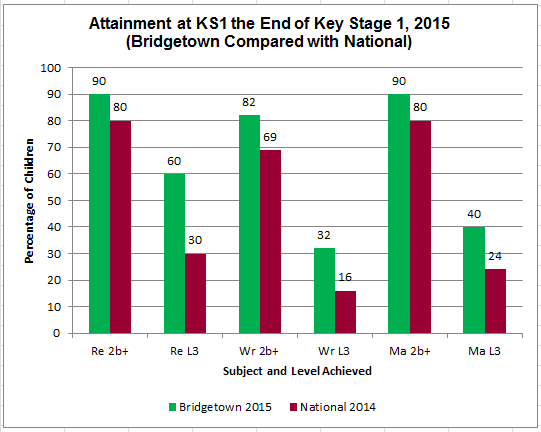 This bar shows outcomes for pupils who have attended Bridgetown throughout Key Stage 2. Once again in 2015, attainment for pupils at the end of Key Stage 1 and at the end of Key Stage 2 was well above achievement nationally. In 2014 our Year 6 children performed well above children nationally at level 4 (the expected level of attainment) and at level 5 (above the expected level of attainment) in reading (Re), in writing (Wr), in the SPaG (spelling, punctuation and grammar) test and in mathematics. A higher percentage of our children also achieved the highly exceptional level 6 in mathematics than children nationally. Children are expected to make progress of at least two national curriculum levels from the end of Key Stage 1 to the end of Key Stage 2.